Cheese is one of our all-time favorite foods. You’ve probably already figured this out about us. That being said, we have a lot of people in our life that can’t enjoy cheese for a variety of reasons. Whether it be lactose intolerance or simply living a vegan lifestyle, cheese boards are simply not something most feel they can enjoy. 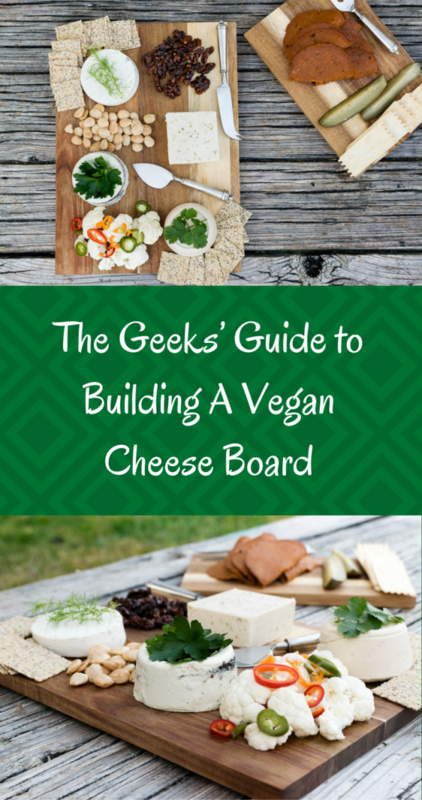 We wanted to change that, so we came up with a guide to building the perfect Vegan Cheese Board. Heidi Ho‘s Ne Chevre (Black Lava)– We really enjoyed the texture and flavor of this cheese. We will say, though, the lemon used in this cheese makes it taste a bit more like hummus than an actual chevre. For garnish, we topped it with fresh parsley. Treeline‘s Chipotle Serrano Pepper– This cheese also good texture and flavor. We wish the spiciness was a bit more present, but otherwise, it was quite tasty. They also have several flavors if you are looking for something a bit more traditional. For this cheese, we garnished with a bit of fresh cilantro. Daiya‘s Jalapeno Havarti Style Farmhouse Block– This cheese seemed to be the crowd favorite in terms of substituting for real cheese. The texture was the closest to the cheese it replaced, as was the flavor. We’ve also been told that it is great for queso. Kite Hill‘s Soft Fresh Truffle, Dill & Chive Almond Milk Cheese– We have used this cheese in the past for a twice baked potato recipe and it was the first dairy free cheese we had ever tried. While the flavor is really fantastic, the texture could use a little work. We garnished this cheese with a bit of fresh dill. Nuts– Nuts are a great element to add for texture. To have both a sweet option and a savory one, we used Marcona almonds and candied walnuts. Crackers– Crackers are an item all about preference. Since we were serving this to someone who was also gluten intolerant, we tried Jilz Gluten Free Crackerz in Sea Salt and Cracked Pepper flavor. These were the perfect flavor for these cheeses! Pickled Vegetables– Ever since our cheese tasting at Murray’s, we have been huge proponents of adding pickled items to our cheese boards. This is a great item to use on a vegan cheese board because obviously, it is naturally vegan without substitution! For the best pickles, we suggest McClure’s! Vegan Meats– If you want to have a board that has a bit of charcuterie in it. Vegan meats are an option. They tend to be a bit tricky to work with and the flavor profiles may not be the best. Use at your own risk. We hope this guide helps all of you cheese lovers who, for whatever reason, can’t have dairy. What are some of your favorite dairy free cheeses? We’d love to hear all about them! Leave a comment below or use the hash tag #GeekEats! *The Geeks were not compensated or given any comped items to facilitate this write-up. All opinions are wholly our own. View our Disclosure Policy for more info. Love your selection and suggestions! Thank you so much for including Jilz and making such a yummy vegan board! You guys rock! this will definitely come handy when m hosting a party with some vegan family members! love this. I’ll be honest in saying i’m not for vegan meals, but having said that HIGH FIVE on loving cheese because that is probably my favourite food to eat. I am aware the awareness towards vegan food is on a high and it’s nice of you to give recommendations for the same. Pickled veggies is another favourite of mine and not only do they look great and colourful on the plate, but add a nice sing too. We aren’t vegan by any means but we have a lot of friends who are lactose free and still foodies so we love coming up with options for them! Although not vegan myself, I do try to limit my dairy intake. 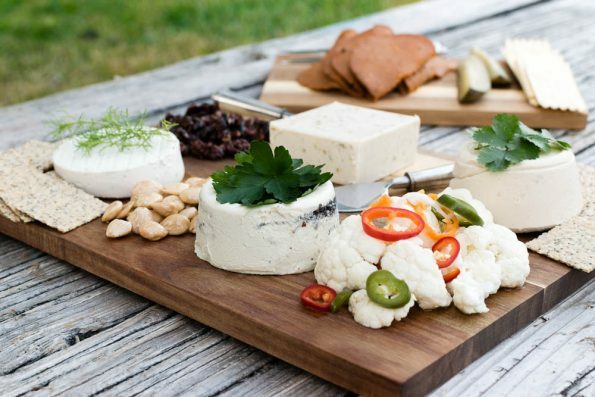 This is a great tutorial on building a beautiful vegan cheese board, thank you! Although not vegan, I am dairy intolerant and a cheese lover. This spread has given me some great options. Healthy looking recipe, I would love to try it. Thanks for sharing! Well this cheese board does look delicious. It’s great there are vegan cheese and meats to use. I have yet to try vegan cheese, but if this was in front of me, I certainly would be tempted. Vegan and cheese board is something I’d never think would go together. This looks great! Cool option for the food restriction parties! I have a group of friends who love their cheese and cracker and their wine. I’m definitely saving this post for them. Cheese is an addiction and this post make it harder for me to resist;) Yum! What a gorgeous spread! So many vegan varieties to choose from too – who knew?! 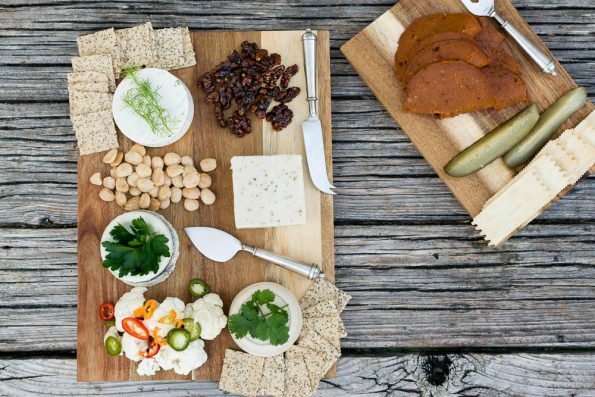 Great ideas for a dairy free cheeseboard. I’m not a great cheese lover but your vegan cheeseboard looks very tempting. I’m a big cheese fan (not vegan), great post! I love the (seeming) contradiction of your post title! I had no idea there was such a range of vegan cheeses–and they keep getting better all the time. Perfect for entertaining an array of eaters!